Penta is the Greek root word for five. So a pentatonic scale consists of only 5 different notes. While there are many possibilities for arranging 5 different notes to create a scale, we are going to look at the 2 most common. They are major pentatonic, and minor pentatonic. In order to fully understand how pentatonic scales are constructed, you should have an understanding of how to construct basic 7 note major and minor scales. Because pentatonic scales are derived from them. Constructing major scales - this is the starting point for understanding all music theory. Natural minor scales - Minor scale construction, and the relationship between major and minor. Learn how the theory is applied to the neck of the guitar. Below is a basic review of major and minor scales, but you should also read the theory lessons here at Cyberfret.com that cover these topics in more detail. A major scale is just a pattern of whole steps and half steps (W W H W W W H). A C major scale consists of the natural notes from C to C (no sharps or flats). 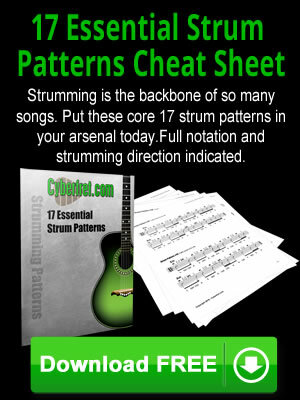 Each note in the scale is assigned a number from 1 to 7. These numbers are very important to your understanding of music theory. As you are looking at different scales and chords, you will be using these numbers to help understand how they are constructed. The major scale is the constant to which you will be comparing everything else to. If you rearrange the notes of a C major scale to go from A to A instead of C to C, this is an A minor or A natural minor scale. It has it's own pattern of whole steps and half steps (W H W W H W W) So a C major scale and A minor scale consist of the same notes, just in a different order. If you apply this pattern of whole steps and half steps to the notes from C - C, you will have to flat the E, A and B notes. This is a C minor scale. You can now see the difference between major and minor by comparing C minor to the C major scale. Since E was the 3rd note in a C major scale, Eb now is labeled with the function "b3". So the minor scale has a b3, b6, and b7 in comparison to the major scale. These numbers are referred to as the formula for a scale.